Are Chimney Cleaning Logs Effective? A chimney caked in creosote is a fire hazard and should never be ignored, but removing all that gunk takes more than soap and water. Chimney cleaning logs, also known as creosote sweeping logs, are marketed as an easy way to deal with this sticky problem. There’s a fair amount of misconception about how these logs work, though. They really can make your chimney easier to maintain, but they can’t replace regular, professional cleaning and they’ll only help if you use them correctly. When the byproducts produced by burning wood hit the relatively cool chimney walls, they condense into a substance known as creosote. 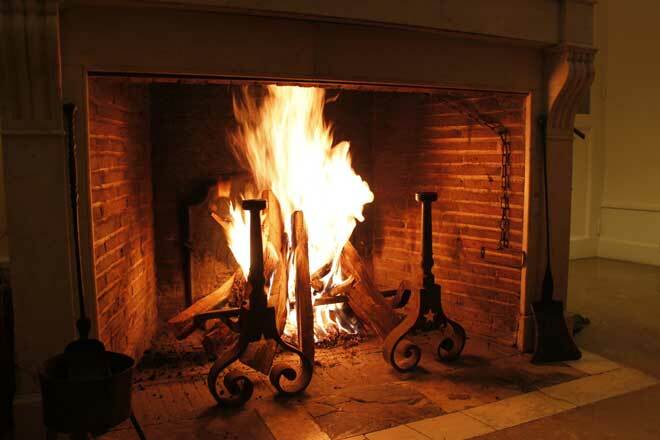 It happens in all fireplaces, but poor chimney draft and burning improperly seasoned wood, or worse, wet wood makes the problem worse. Over the season, creosote builds up on the inside of your chimney. Because it’s highly flammable and a common cause of chimney fires, it must be cleaned out every year. Sometimes that job is easier said than done. Creosote usually starts off light and soft or crusty, but it can turn into a thick, oily, tar-like substance that will take a chimney sweep considerable time and effort to remove. The harder your chimney is to clean, the more that cleaning will cost you. Chimney cleaning logs make the creosote easier to remove. They contain chemical additives that rise up through your chimney and stick to the creosote deposits. These chemicals dry out the creosote, turning it into a flaky substance that’s less flammable and easier to remove. After you burn a fireplace cleaning log and then continue to burn regular firewood, the chemicals work on the creosote for around two weeks. Some of the dry creosote will fall down into the fireplace where you can sweep it away. The whole process can reduce the buildup in your chimney by as much as 60 percent. That means a faster, easier job for your chimney sweep and a lower price for you. First stage – Light and puffy with a high soot content. Easily removed with a chimney brush. Second stage – Somewhat sticky, but flaky. Can be removed with a chimney brush and some effort. Third stage – Also known as glaze, these hard, tarry deposits can’t be removed with an ordinary chimney brush. The first two stages are the most common, the easiest to clean, and the least affected by chimney sweeping logs. If your chimney has only a small amount of light creosote, you might not get much benefit out of these logs. Third-stage (glazed) creosote forms most often when the fireplace wasn’t built well, or you haven’t been using it correctly. Maybe your chimney is too short and lacks sufficient draft, your flue is too big, your home doesn’t have much airflow, or you’ve been burning unseasoned wood. Glazed creosote is relatively rare, but it’s where chimney cleaning logs really shine. In fact, only chemical treatment can completely remove glaze. The log does a lot to break down the glaze, making the cleaning job easier for your chimney sweep. Before you buy a chimney cleaning log, make sure it will work with your fireplace. They don’t work with pellet stoves, for instance. If you burn one or two fires a week, it’s enough to burn one chimney cleaning log either at the beginning or middle of the season. If you burn a fire a day, you’ll need two logs: one at the beginning of the season and one in the middle. Don’t use the log the first time you make a fire for the season. First, burn fires with regular firewood for two or three days to make sure there are no issues with the fireplace or chimney. Before you use the creosote sweeping log, inspect your chimney for leaves, animal nests, and other debris and obstructions, and make sure your fireplace damper is open. If you have a wood stove with a catalytic combustor, close the device using the bypass mechanism. Leave it this way for the next week or two as the chemicals in the chimney cleaning log do their work. Read the instructions before you remove the log’s packaging. Some logs are designed to be burned with the packaging, although you’ll need to loosen the packaging a little to allow airflow for burning. To minimize risk of downdrafts, burn a fire with regular wood, then after this fire has died down, place the chimney cleaning log on the hot embers. If the room has poor airflow, open a window to get more air in. Never put a creosote sweeping log in a burning fire. Once the log is burning, leave it alone. Poking it or adding wood to the fire can cause it to burn too hot. After the flames die down, the log will keep smoking, so keep the damper open. Over the next few days, you should notice dry creosote, which looks like ash, falling down from your chimney into the fireplace. If you’re due for a professional chimney sweeping, wait a week or two after burning the chimney cleaning log before you have the chimney sweep come in. Even if you use chimney cleaning logs correctly, you’ll still need to schedule an annual professional cleaning and inspection of your chimney and fireplace. More than just brushing out your chimney, chimney sweeps also inspect for damage and other problems that pose safety issues. If you have sticky or glazed creosote, though, using a chimney cleaning log can help your chimney sweep get the job done faster.